My Name is My NAME! After nearly 6 months Toronto Rapto Chris Bosh has finally won his suit against a cybersquatting company that had registered the domain “chrisbosh.com” and nearly 800 other athlete’s names. Luis Zavala and his company Hoopology.com had registered dozens of domains using various NBA players’ names including stars like Deron Williams, Tayshaun Prince, Rashard Lewis, Danny Granger and Maurice Williams using their celebrity to drive traffic and earn advertising dollars, without the players’ permission. 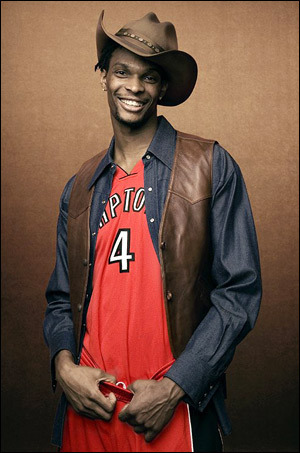 In her final ruling, Judge Florence-Marie Cooper relinquished control of chrisbosh.com to the Raptors star, as well as giving him possession of the nearly 800 other domain names Zavala had registered. B0sh also won $120,000 in April for the violation of his rights under the U.S. Federal Anti-Cybersquatting Consumer Protection Act in a California federal court. Of course, cybersquatting is totally lame, and Chris Bosh shouldn’t have his name being used without his permission but I’m a bit confused as to why the Judge gave Bosh possession over the other domain names, why not just return them to the proper people. Sure, he SAYS he’s going to return them, but what if he decides he hates Andrea Bargnani and just refuses to give it back?